Mad March Hare uses only the best, locally sourced, malted barley. As you would expect, fine Irish Poitin needs fine ingredients and most of our suppliers are farmers within a couple of miles of our stills, with equally rich histories in the growing of the this key ingredient. As one would expect, their covert deliveries are made in the dead of night. Commonly used to distill whiskey and brandy, copper pot stills were first used in the production of Irish Poitin. 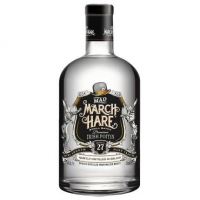 We retain that long and rich tradition with Mad March Hare, as copper has catalytic properties that more modern ‘column stills' cannot match. If it ain't broke. . . Oh, we forgot to mention, we are triple distilled! Recipe No27 harks back to a bygone era in Irish distilling. Such was the demand for Mooney's famous Poitin; he braved the wildest Irish weather and the long arm of the law to serve his loyal customers. His powers of evasion were only matched by his powers to distill. After all, it only took him 27 attempts to get it just right! Be prepared to be seriously impressed. 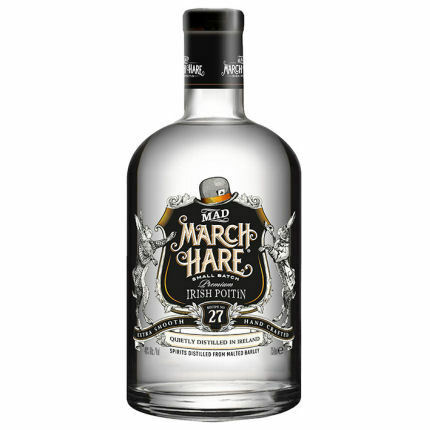 Mad March Hare has a pristine, shimmery appearance, a medium-weight, velvety textured body and a glorious bouquet saturated with the aromas of citrus, cocoa, anise, baked apples and barley malt. The iconic brand's aromatic signature is downright irresistible. Its entry onto the palate is satiny smooth and devoid of any excessive heat. The finish is long and brimming with the flavors of citrus and spice. Blindfolded you'd swear Mad March Hare had been well matured in oak.